Well, my wife had expressed a desire to ride a Can Am Spyder, in an effort to join me in the motorcycle riding experience. But, tired of sitting behind me and unwilling to attempt to manage a two wheeled bike on her own, a three wheeled Spyder works for her. Actually, it makes a lot of sense, for lots of reasons, and, it can carry a ton of ‘stuff’ to boot! In an effort to address the itch, I was able to rent one from my local dealer (Also EagleRider- see review), at a 50% discount, early in the week. So, while dropping my bike off for service, I grabbed an electric blue 2012 Can Am Spyder RT with 10,000 miles on it and rode it home, after some training, of course. If you are a rider, you really need to suspend your disbelief- pretend you are at the movies. Or, better yet, pretend that you are on a snowmobile- the whole experience will improve for you immediately! 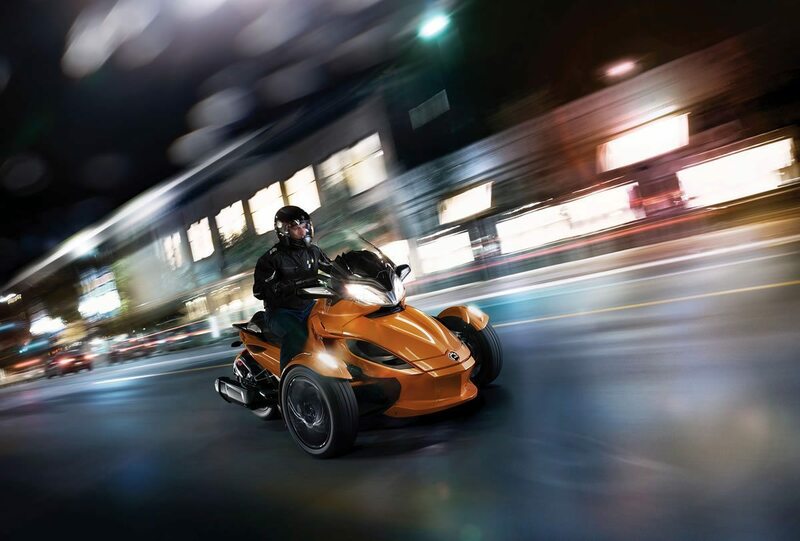 Dynamically, visually & even common sense says that this 3 wheeler will not ride like a motorcycle, let alone a trike, with its own issues of balance. But, BMP, a manufacturer of airplanes & trains- has spent some real money designing and building a genuine 3 wheeled recreational vehicle that works on the road. But, it’s not a motorcycle, and, it doesn’t ride like one either. There must be a way to prepare a rider for this experience, otherwise, the disappointment can be enormous. As a rider, I absolutely love the feel of leaning into a curve, balancing on 2 wheels, adding throttle as I complete a turn- its Zen perfection for me. All of that experience on two wheels just doesn’t prepare you for the 3 wheeled experience. Like most bikers, I was terribly unimpressed with it, from the first turn. But, I lack experience with snowmobiles, and, although I have ridden personal watercraft, they are a very different experience as well. I was completely unprepared for the way it rides. In an effort to understand 3 wheeled limits, I rode it hard from the very beginning- which was my first mistake. The whole ride home, tracking every road imperfection, adjusting my line in every turn several times, fighting the handlebars in every curve, and, it felt twitchy on the highway. It reminded me of an old Geo Tracker with several hundred thousand miles on it. I felt that I was riding a hobby horse, bobbing all over the road, not to mention struggling to keep each wheel in my lane at all times. Considering it on the way home, I was sure that my wife would really hate it: too big, funny looking and the ride, forget it- I wished I had said that it was already rented! My wife (a cautious one) hopped right on and, with a few minutes of instruction- rode off waving confidently, left me in the dust, visited a friend and came home an hour later. She thought it was perfect- right out of the box. How could our experiences be so different? Later in the afternoon, after many rides by her & I – alone and together – the dealer called and offered the Spyder overnight since my bike was not ready yet. I thought, another chance for me to learn how to like it? So, I rode it several more times, and, I finally figured out the way to enjoy it, purely by mistake. After spending all day assaulting it, pushing it and myself to the outer limits of my comfort zone, at dusk, I decided to ease back, considering the increased dangers of night riding. As dusk fell, temps cooling, traffic dissipating, headlights taking over the road, suddenly, the Spyder RT felt right. Everything worked well together and the whole bike gelled. 3/10th’s is the comfort zone for this bike. Plenty of power, good instrumentation, large and well placed mirrors, with its quiet ride and adjustable windshield, all work together to provide a comfortable mode of transportation. 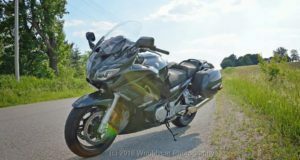 During the daylight hours, I sat behind my petite wife, in her riding gear, watching her confidently ride this large, over 1,000 pound, 3 wheeled bike like she born to it, wondering why she felt so comfortable? It took this improbable scenario to repeat hour after hour for me to make the effort to figure out what I was doing wrong. My best guess is that most riders will hate it at first, as it tracks every bump, pebble and road imperfection. If you don’t spend every minute trying to break the tires free, or, generate over 1g of lateral acceleration on every turn, or, maintain double the posted speed limit on every road you are one- it may make sense, sooner at least. Because it’s an unusual arrangement (2 wheels in the front, 1 in the rear) there is no reference point to help you understand how best to ride it. Sure, suspending your disbelief is a start, and, pretending that you are riding a really huge Victory, or, the biggest H-D cruiser that you’ve ever seen might help ease the transition. I honestly didn’t understand that 3/10ths or so, for a few minutes, would help me understand it quicker. Once I ‘got it’ the bike made perfect sense, and, I actually began to enjoy it. Even then, it’s still not a motorcycle. I don’t own, nor do I have any desire to own a giant touring cruiser. Almost as big as a car, with more storage on board than my bureau and closets combined, not to mention seats larger and more comfortable than any chair, sofa or couch than I own at the present time- they really are too much of a good thing to me. But, I can’t imagine racing a sport bike from a stoplight on one, or, driving it hard down canyon roads either. Then, why couldn’t I see that the Spyder is even bigger? Like a giant cruiser, when ridden within its zone, it rides comfortably, even nicely. Big, plush, clear instrumentation, lots of buttons & controls, cruise control that works well and is easy to use- it makes for an enjoyable ride. Roomy for rider and passenger, excellent visibility, power adjustable windshield- even on the highway, it’s really functional, and, can be ridden in most weather with ease. But, it’s NOT a motorcycle, and, can’t be ridden like one. These days, BRP has a few different flavors available, from the RS (Roadster Sport) to the RT (Roadster Touring), where you sit straight up, bars falling right to your hands, and, large, wide, rubberized foot pegs are forward, for a 90 degree, comfortable knee bend. The seat is broad, and, comfortable, but, the central tunnel is broad, so, your legs are splayed wide- all of the time- so, your hips will get sore over long periods in the saddle. The rear passenger is seated higher, so, they have less splay, and, therefore can go longer distances with less discomfort. Everything is massively overbuild, so, there is immediate confidence in the whole machine. A 998cc Rotax engine (an in-line, 1330cc 3 cylinder motor is standard in 2014), feels comfortable at all revs, it never feels stressed or overworked, never develops vibrations and never sounds rough. Wheels, tires & suspension all look very robust, and, one gets the sense that it has been thoroughly engineered to provide the best possible ride, with longevity as a focus. Nothing looks cheap or ill considered, the lines are different (but, so is 3 wheeled conveyance?) but, appealing in a spatially balanced perspective. Because it’s large, with a rear trunk and passenger throne, integrated side bags and a large car sized rear wheel putting down the power, you will get noticed, regardless of color. The RT, in addition to the cruiser style seating, has lots of amenities from the factory. Not inexpensive new or used, I guess it should be expected to have buttons, a computer, and a digital screen display, showing and tracking all sorts of useful data for the driver. Large analog gauges for Speed, tach, engine temp and fuel are well spaced, surrounding a large digital screen that shows many pieces of useful data. The central display screen is readable in any circumstances, and, does NOT wash out in direct sunlight. Personally, I did not like the drop down menus of the computer, but, it makes sense and is somewhat easy to use. With the stock, power adjustable windshield, which is optically clear and large enough to create a disturbance free zone for the driver- the passenger is not in the pocket. The mirrors (manually adjusted by pushing on the lenses) are big, convex and show everything- a very good design with outstanding visibility, creating confidence at all times that you know where everyone else is on the road around you. Along with the highly engineered pieces and parts, all of these machines have alot of safety features designed in. From unified brakes all around with a single foot pedal, to ABS, traction control and anti-roll over software, you would think that you could never have any fun. But, you would be wrong, as I was simply unable to engage any of those features when riding it around alone, although, I didn’t really try. I did push the machine, trying to get some high speed turns completed, but, I never felt a pulse at any wheel, at any time. Other riders have pushed much harder than I, and, they were able to get the computer to respond, but, it was well out of my comfort zone. BRP is finally getting its hand around the rider demographic for a 3 wheeled open bike. When a new, young company, they offered a 3 wheeled ‘sports’ machine. In 2010, they created a touring version, which actually works better for almost anyone interested in having 3 wheels for the added stability. With the addition of the touring model, interest in 3 wheels has increased exponentially. Now, big bike riders, who are considering a trike, as they reach the end of their riding careers, and, women of all ages have a way to join their riding friends. This single addition to the lineup, has opened up the market for potential buyers. Buyers who are not afraid of big price tags ($24k for a H-D trike, for example), but, also not looking for 0 – 60 times, lateral G’s or any other performance characteristics, they want the comfort of a larger environment, a quieter ride, less vibration and lots conveniences: cruise control, heated grips, stock stereo with passenger controls as well. 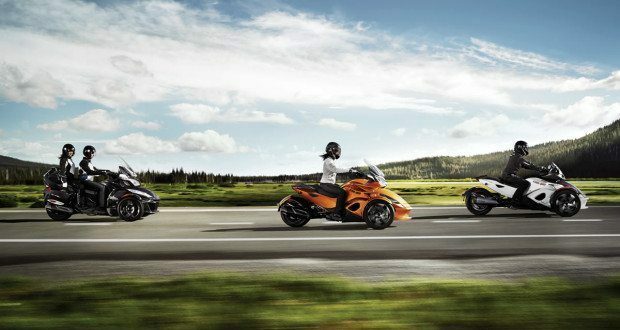 Interestingly, new or used, the Spyder’s pricing falls well within the confines of its two wheeled peers. Starting at $23,200 new, the model line-up goes up to $30,800 for the Limited. Also, used pricing does match up well with the very large two-wheeled cruisers. A cautionary note: older Spyders (2007 -2009) were essentially RS’s Can Am’s ‘sport bike’ version. 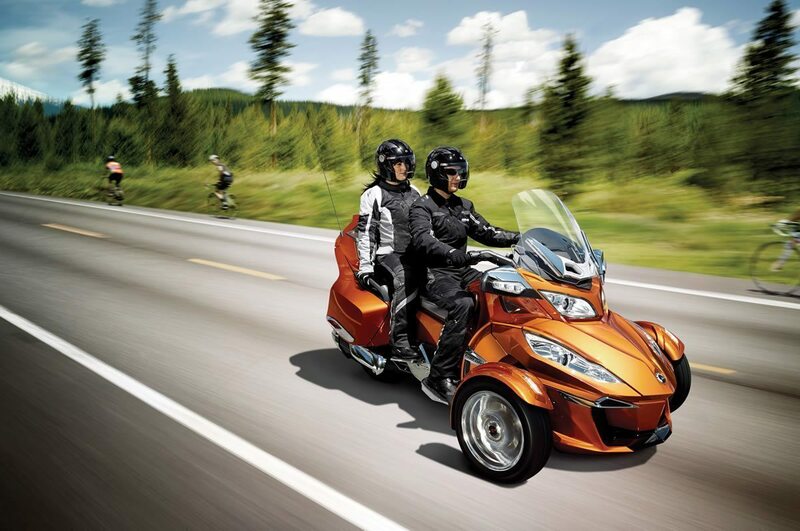 There are too many perfect Spyder sport bikes with low miles, however well owned and properly stored. 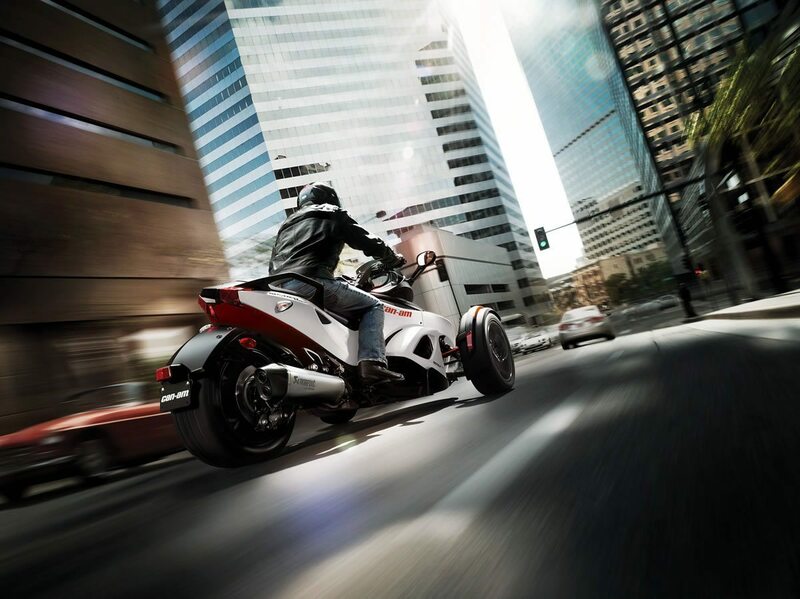 The conflict is: much smaller, sport bike position, much less storage, and, almost no visual interface for the rider. However, the paddle shifting semi-automatic is available, for those who don’t want to shift. Until the market contains enough used RT’s to meet the increasing demand for a comfortable 3 wheeler with a stereo, heated grips and an onboard computer, those prices will remain high. Finally, the new 3 cylinder motor, with 40% more torque will be a big draw for buyers. Even smoother than the 998cc motor, it sounds great with stock pipes- quiet at low RPM’s, with a nice growl as load increases. Intoxicating and addictive are the first two words that come to mind. BRP has been consistent from the very beginning, using only the highest quality parts, and, engineering all functions to work well for a very long time. 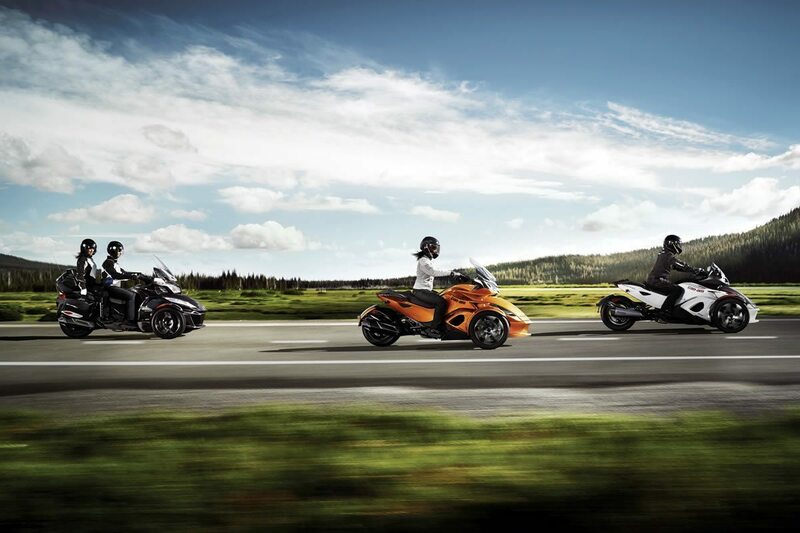 So, if a new rider enjoys the sporty riding position, they will get an excellent value for their investment. The aftermarket, and BRP, have been offering lots of products since the very beginning, so, customizing and creating a well-functioning bike for your specific needs will be expensive (all bikes are expensive to modify though! ), but, very doable without re-inventing the wheel. So, if you can step aside from your motorcycle thoughts, and, ride it as if it were completely different, and, it is a wholly different kettle of fish, you may find that you enjoy it. If you are already riding a very big bike, it may be an easier transition. 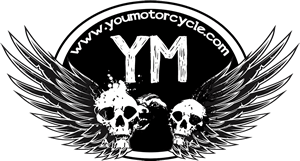 If, you’ve never ridden a motorcycle before, you have a huge advantage, as you will bring no pre-conceptions of how it should ride. But, if you are like 90% of those who hop on it- your initial impression will be terrible. But, at 30% effort, it will provide a powerful, quiet, vibration free ride, with a good stereo, excellent mirrors, lots of data, cruise control and more storage than you can shake a stick at. With that approach, it can provide years of dependable service, provide a very controlled, comfortable ride, with a large safety margin built in. When I left the dealership I hated it, when I returned, I didn’t want to turn in the keys! Ive been riding 2 wheeled bikes all my life.At the age of 66 im thinking of making the switch to the Can Am and my wife is looking forward to riding with me. I’d jump on one when the V-Rod starts to get too heavy for me.